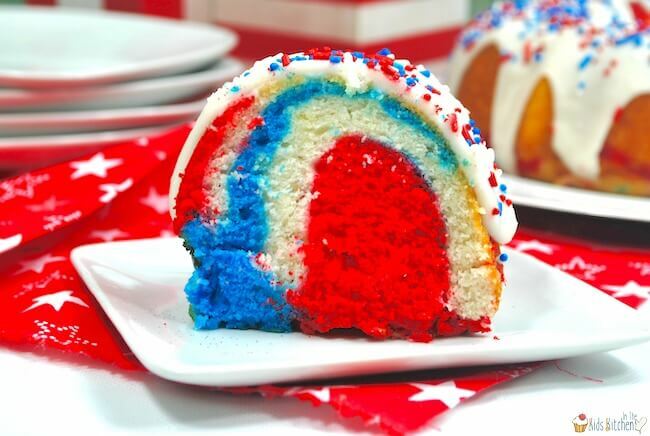 What’s Inside: How to make a fun and patriotic Red White & Blue Swirl Bundt Cake for 4th of July or Memorial Day. 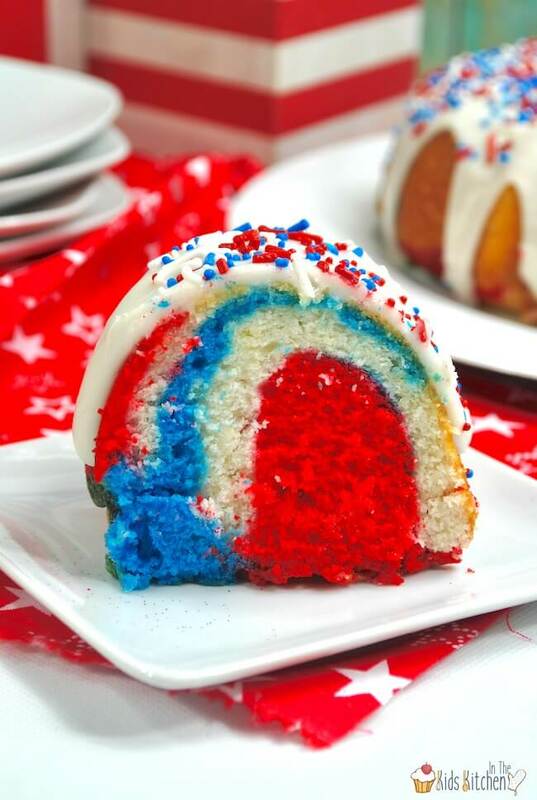 Your party guests will think this Patriotic Bundt Cake looks beautiful on the outside, but just wait until they see the surprise inside! 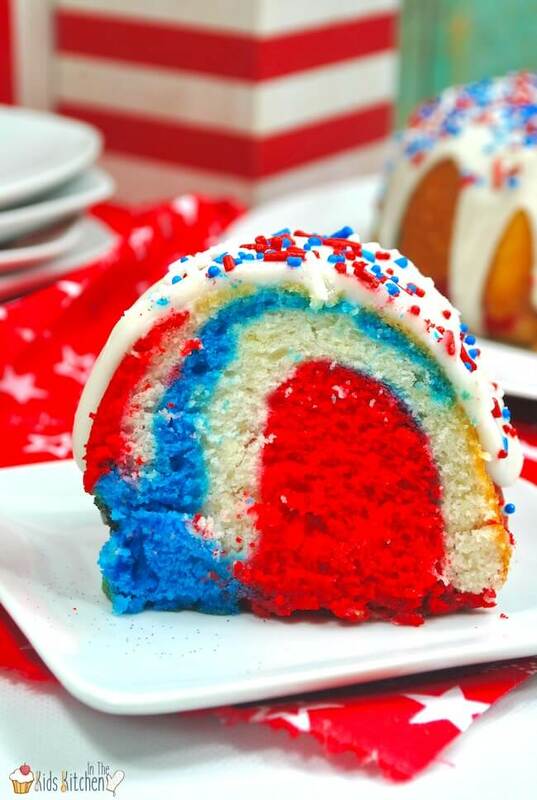 I just love the vibrant swirls of red, white, and blue in this bundt cake! 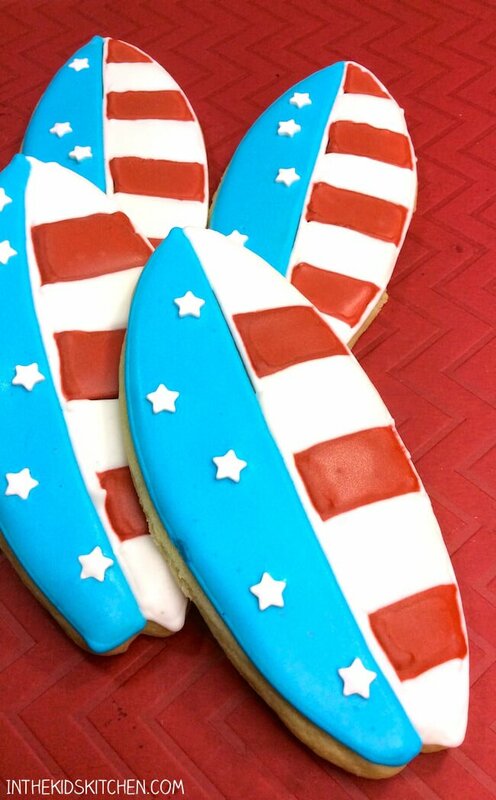 It’s super festive and perfect for any of your USA themed events like 4th of July and Memorial Day. Get the kids involved by letting them help with creating the different color batters, swirling the cake, and decorating. You can add even more holiday decoration if you like, from edible star sprinkles to red, white, and blue frosting! 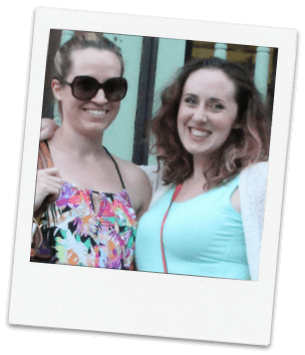 Keep reading for photo step-by-step instructions and cooking tips -or- scroll to bottom of post for a free printable copy of this recipe. Preheat oven to 350°F. Coat the inside of a bundt pan with non-stick cooking spray and set aside. Combine all cake ingredients in a stand mixer and mix on medium speed until fully combined (or about 3-5 minutes). Divide the cake batter into 3 smaller bowls. Add 2-3 drops red food coloring into one bowl and stir until the batter is a rich red color. Add 2-3 drops blue food coloring into the second bowl and mix until combined. TIP: Start with 1-2 drops food coloring and add more as needed. Leave the third bowl of cake batter white. Spoon batter into the bundt pan, alternating between colors to create layers. When all batter is in the pan, use a knife to swirl the batter. Bake for 40-55 minutes at 350°F. TIP: Test cake by poking a knife into the middle. If it comes out clean, the cake is done. If batter sticks to knife, bake for a few additional minutes. Allow cake to cool completely in bundt pan before flipping onto a plate. Combine all ingredients into a large bowl and mix until smooth, using a stand or hand mixer. TIP: Transfer glaze into a measuring cup or squirt bottle with a large tip for easier pouring. Pour or squirt glaze onto the cake. 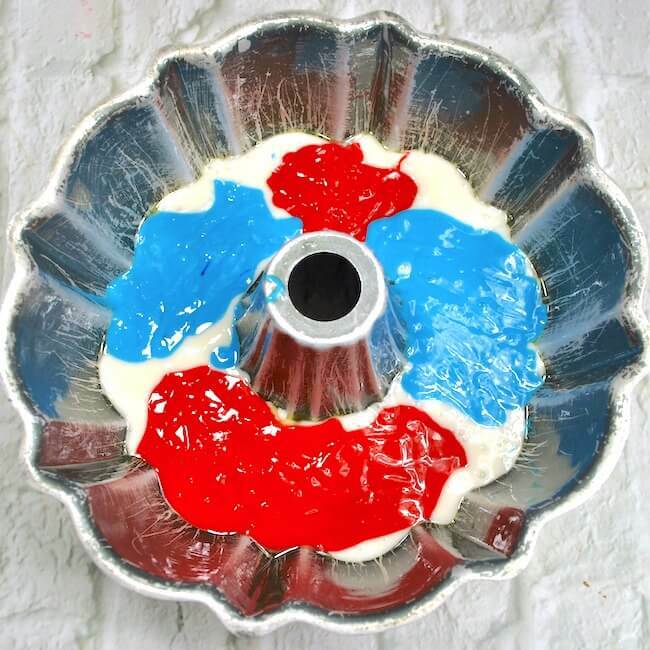 While glaze is still wet, cover generously with red, white, and blue sprinkles. Allow glaze to harden before serving. 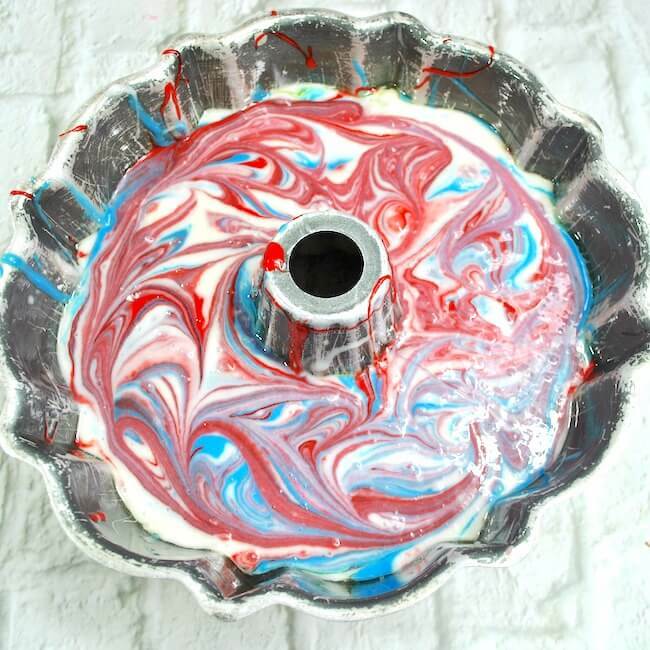 How to make a fun and patriotic Red White & Blue Swirl Bundt Cake for 4th of July or Memorial Day. Preheat oven to 350°F & coat bundt pan with non-stick cooking spray. Allow cake to cool completely in bundt pan before transferring to a serving plate. Pour or squirt glaze onto the cake. 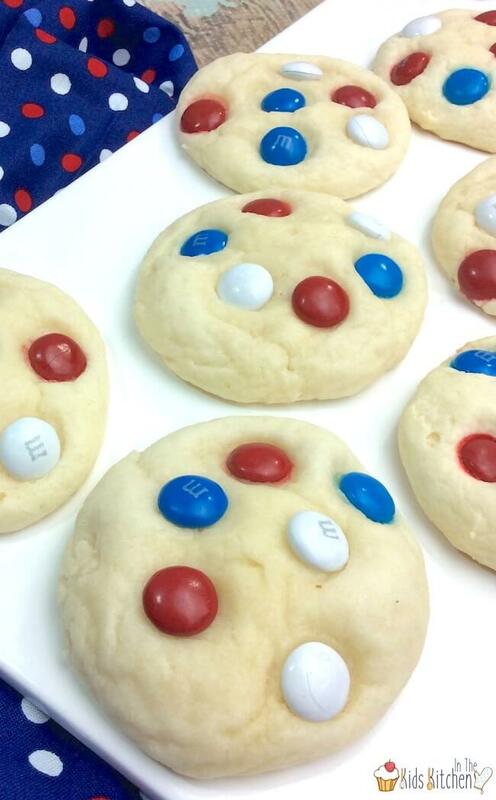 While glaze is still wet, coat with red, white, and blue sprinkles.